Writing Sunday’s post about unfamiliar vocabulary in El séptimo velo, and in particular the words metralla and ametrrallada, started me thinking somewhat nostalgically about Spanish vocabulary I’ve found hard to learn, and what strategies have worked for me. In general, since I’m an analytic thinker, especially when it comes to language, I have trouble with words that I can’t tackle using cognates or other types of linguistic analysis. Strangely, the best solution for me in such cases is often anti-analytic. I specialize in truly ad hoc mnemonics, often based on false cognates (so-called amigos falsos). The more far-fetched, the better. Some kinship terms beyond the basics caused me a headache “back in the day”. Sobrino and sobrina “nephew/niece”, for instance, lack an English cognate. My ad hoc mnemonic for them is therefore based on a false cognate: I think of a “sober” (i.e. non-drinking) nephew. Nieto and nieta “grandchild” are cognate with “nephew”, unfortunately; we owe to French the perversion of the original Latin meaning, which Spanish has preserved. My solution, then, is to picture a “nice” grandchild. In-law terms were a mixed bag for me. Suegro and suegra “parents-in-law” came easily. These are ugly words — they sound like sweat or suet — which I have always found reminiscent of the negative stereotype of these relatives, especially mothers-in-law. (My own mother-in-law is an exception, thank goodness.) I had more trouble with other in-law terms. I finally mastered cuñado/cuñada “brother/sister-in-law” after learning the word cuna “cradle”, since one might visit one’s sister-in-law to admire her baby. My mnemonics for yerno and nuera “son/daughter-in-law” are truly bizarre. To me these sound like terms one might associate with animal husbandry, like yearling or nursling. And the propagation of the family line is, after all, the point of acquiring these relations. Going back to metralla and ametrrallada, I’ve been seeing the word ametralladora “machine gun” for years without managing to remember it. I think the noun’s ending was playing with my analytic brain. The noun suffix –or or -ora usually connotes a person or object that produces something. A tostador (or tostadora) makes toast. An escritor creates written work. An aspirador creates suction. But an ametralladora doesn’t make anything; it just kills. Had I looked up the word’s etymology, as I finally did on Sunday, I would have known that metralla means shrapnel. Now I will always remember the word, because an ametralladora produces metralla. I guess the moral here is that one should always research etymology when dealing with a stubborn word. My current struggle is with a substantial class of action verbs beginning with de- or des-, including derrotar, derretirse, derrumbar, deslizar, and desmoronar. These all have negative meanings: defeat, melt, demolish, slide (this can be negative if you’re on a cliff), and collapse. I have trouble with these words because I encountered all of them at about the same time, when I started teaching Spanish and began working on my language skills seriously again. I think of this as the geshem/shemesh problem. These two words mean “snow” and “rain” in Hebrew (or is it “sun” and “rain”? ), but because I learned them together, I can never remember which is which. The solution for the de(s)- set seems to be continued vigorous reading. Each time I see one of these words in context it becomes a little more distinct. Maybe in the not-to-distant future I’ll be ready to use them in conversation. Then I can go on to the next hurdle! There is always more to learn. This entry was posted in Vocabulary and tagged amigos falsos, cognates, false cognates, kinship terms, Spanish, vocabulario, vocabulary on 24 September, 2013 by jhochberg. For the last several weeks I’ve been making slow but steady progress through Juan Manuel de Prada’s towering novel El séptimo velo. Like this blog, it’s been taking back seat to my teaching. As described in an earlier post, El séptimo velo is a romantic novel set mostly in post-war France and contemporary Spain. I learned of it from a reading list distributed by a professor at the Universidad Complutense de Madrid. This novel is unbelievably rich in vocabulary. My Spanish is excellent, I think, good enough to tear through a sophisticated thriller like Guillermo Martínez’s La muerte lenta de Luciana B. in a matter of hours, and in a typical book I rarely find more than two or three new words on a page. De Prada’s Spanish came as such a shock that I decided, as an intellectual exercise, to (i) write down all the new words I encountered on a random page, (ii) record what I thought they meant, and why (iii) look up their actual meanings, and (iv) blog the results. The random page was p. 315 of the 2008 Harper Collins Planeta paperback. This humbling experiment turned up 30 new words on one page!!! — of which I correctly interpreted more than half. The first part of this statistic gave me second thoughts — and even third and fourth — about writing this post. Revealing how much Spanish vocabulary I still don’t know, after years of studying and teaching the language, is somewhat embarrassing. But I decided to go ahead because vocabulary, and how we learn it, is such an important topic. For one thing, while English speakers may be aware that English has an enormous lexicon — over 450,000 words, according to David Crystal — they may not realize the extent of the Spanish lexicon. The Real Academia‘s dictionary has about 162,000 words, almost 100,000 more than an educated person learns in a lifetime (again according to Crystal). The Spanish lexicon combines a native Latin base with substantial borrowings, mostly from Arabic, Germanic, other Romance languages, Latin (again) and Greek, English, and native American languages. Second, since I’m always telling my students to use context, cognates, and familiar Spanish vocabulary to deduce meanings, I was curious to see how far this actually takes a reader (i.e., me). The use of context in particular is of broad linguistic interest, because it enables babies to learn language, and adults to communicate under difficult conditions, for example over a poor telephone connection. Finally, I’ve become fascinated with de Prada’s Spanish. His vocabulary is not only immense but also erudite. Elsewhere in the book, for example, he uses preñada, instead of embarazada, to mean “pregnant”. I would love to hear how native Spanish readers of this blog respond to the vocabulary listed below. How obscure is it? The only word I couldn’t even guess at was chabola. I misinterpreted several words: troncho, deje, forzar (in a weird context), barullo, ráfaga, metralla and ametrrallada, atronar, cordura, quincalleros, and zalamero. Of these, I came closest on deje (“accent”), recognizing its connection with dejar, and with barullo “racket, din” — I guessed “crowd”. The most personally galling were metralla and ametrrallada, because I’ve tried to memorize the word ametralladora (“machine gun”) several times. I’ve also run into zalamero and may even have flash-carded it a few years ago. I correctly deduced the general semantic category of several words from context, like a good Spanish student (or baby). For example, I assumed that berza “cabbage” was a kind of food, and batahola “racket, din” a kind of noise. Other words in this category were chalán, prole, enjuto, estrépito, apelmazado, esportillero, and arrumbadero. The last two were quite obscure. Esportillero wasn’t in wordreference.com, though I found it in the RAE. Arrumbadero was in neither. I “looked it up” by consulting the friendly and expert participants in the Word Reference Spanish vocabulary forum. I figured out several meanings thanks to English cognates and my existing Spanish vocabulary. 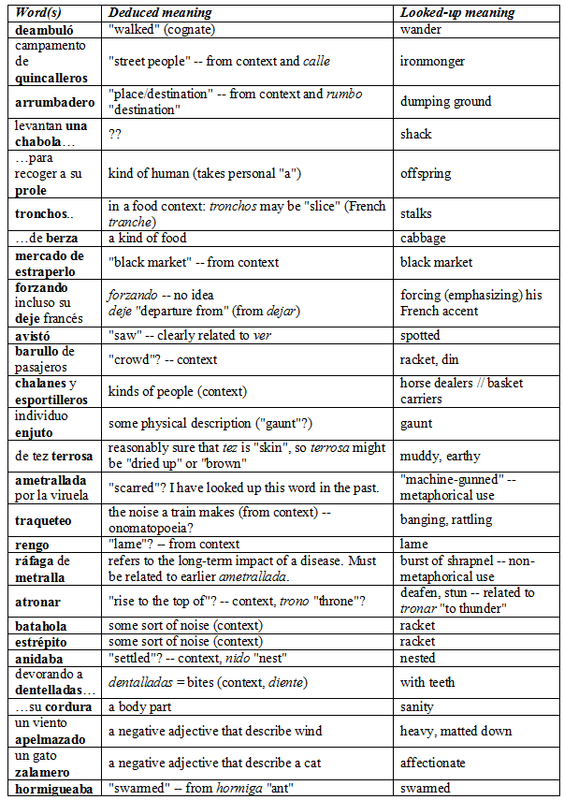 For example, English amble and ambulatory gave me deambuló, and Spanish hormiga “ant” gave me hormiguear “to swarm”. Context made estraperlo and traquateo absolutely clear. Onomatopoeia also helped with the latter. This entry was posted in Vocabulary and tagged cognates, El séptimo velo, Juan Manuel de Prada, Spanish, vocabulary on 22 September, 2013 by jhochberg. While I’m not much of a “beach person” — I don’t like the heat! — the last few weeks I’ve been craving a beach day. It really wouldn’t feel like summer without going at least once. So on Saturday, a girlfriend and I visited lovely, peaceful Hammonasset State Park in Madison, CT. It hit the spot. Just before leaving for the beach I received the long-anticipated “”Welcome to the fall semester” email from the Spanish language coordinators at Fordham University (this is where I teach). All of a sudden the first day of classes (Wednesday!) feels real. I’m sure my future students are going through the same mental process. I will be teaching two sections of second-semester Spanish, and getting to know a new textbook, Gente. two posts on the subjunctive: why there are two imperfect subjunctive conjugations, and why the subjunctive is so irregular. one post each about pretérito irregulars and the outcome of Latin verb tenses in Spanish. Five posts have concerned vocabulary: Spanish slang, Spanish last names (women’s issues and patronymics) special vocabulary for disabilities, and new Spanish vocabulary from the economic crisis. Four posts address Spanish spelling: accent marks, phonetic spelling (or not), x vs j, and x vs. cc. Three posts address contemporary language issues: the minority languages of Spain, the high degree of metalinguistic awareness of normal Spanish speakers, and the political [in? ]correctness of the language name Spanish. This leaves two miscellaneous posts, on voseo and the surprising history of the word y “and“. Four of the above posts were part of Spanish Friday: here, here, here, and here. During the summer the blog has been enriched by comments from readers from around the world. I really appreciate this and encourage you to keep writing. Please feel free to suggest new topics you’d like this blog to address, or enhancements — I’ve added an RSS feed but still haven’t invested any time in Twitter or Facebook. I much prefer to “just write”, but if any bells and whistles would make a difference I will invest the time. I just added a snazzy new background (made with Wordle) and hope it renders well on your screen. To subscribe by email, use the form on the right. It’s been a great summer, and I’m looking forward to continuing into the new academic year. 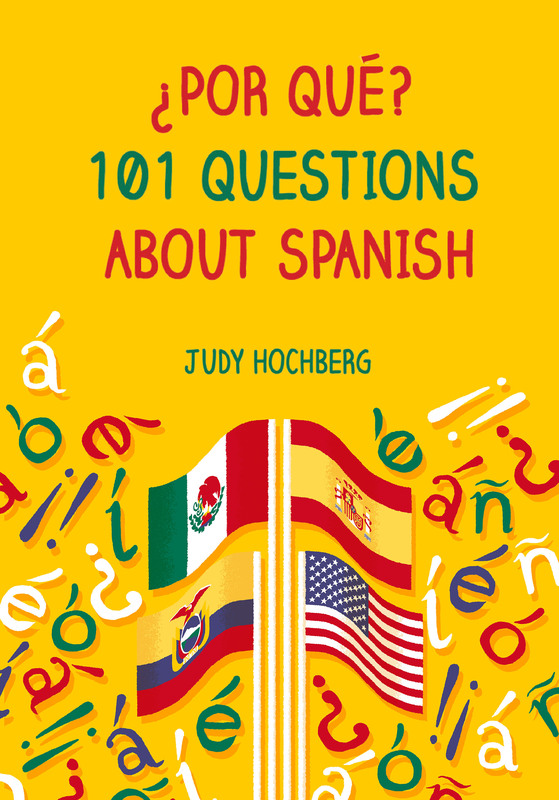 This entry was posted in Learning Spanish, Spanish Friday, Uncategorized, Verbs, Vocabulary and tagged irregular verbs, Spanish, vocabulary on 26 August, 2013 by jhochberg.